BELLVILLE — Braeden Hill, left, sits upon his second-place pumpkin at the Bellville Street Fair. Braeden’s pumpkin weighed in at 348 pounds. Madeline Hill, right, entered a pumpkin that weighed in at 421 pounds, and won the top prize in the 2018 “Largest Pumpkin Contest.” Madeline’s prize-winning pumpkin came with a $250 cash prize. Photo courtesy Megan Hill Braeden Hill, left, sits upon his second-place pumpkin at the Bellville Street Fair. 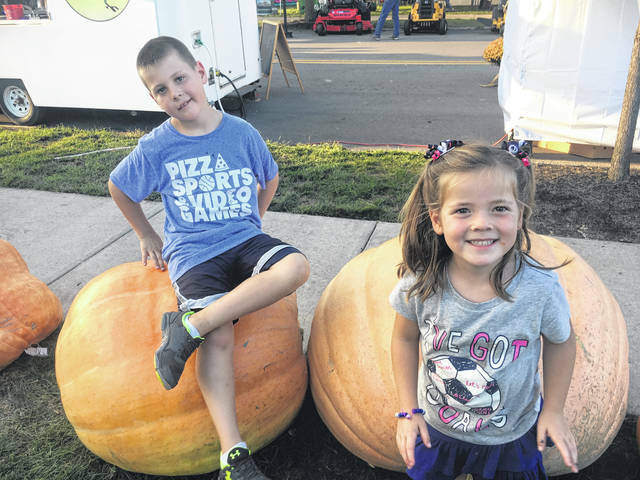 Madeline Hill, right, entered a pumpkin that weighed in at 421 pounds, which won the top prize in the 2018 “Largest Pumpkin Contest.” Braeden’s pumpkin weighed in at 348 pounds. Madeline’s prize-winning pumpkin came with a $250 cash prize. https://www.thebellvillestar.com/wp-content/uploads/sites/39/2018/09/web1_pumpkin-3.jpgPhoto courtesy Megan Hill Braeden Hill, left, sits upon his second-place pumpkin at the Bellville Street Fair. Madeline Hill, right, entered a pumpkin that weighed in at 421 pounds, which won the top prize in the 2018 “Largest Pumpkin Contest.” Braeden’s pumpkin weighed in at 348 pounds. Madeline’s prize-winning pumpkin came with a $250 cash prize.